Style | Wedding Guest Style Guide + My Favorite Tips & Tricks! It's officially wedding season and I wanted to share some of my favorite tips and tricks with all of you! I often get asked the question "What should I wear to ___'s wedding?"! I've also worked in retail for many years and styled a lot of different women (and men!) for weddings. Through the years, I've found that one of the most stressful things about attending a wedding is the unknown. The more prepared you feel for the wedding you're going to attend, the more confident and relaxed you are! Not knowing the tone and dress etiquette of the wedding you're going to tends to be the number one stressor. 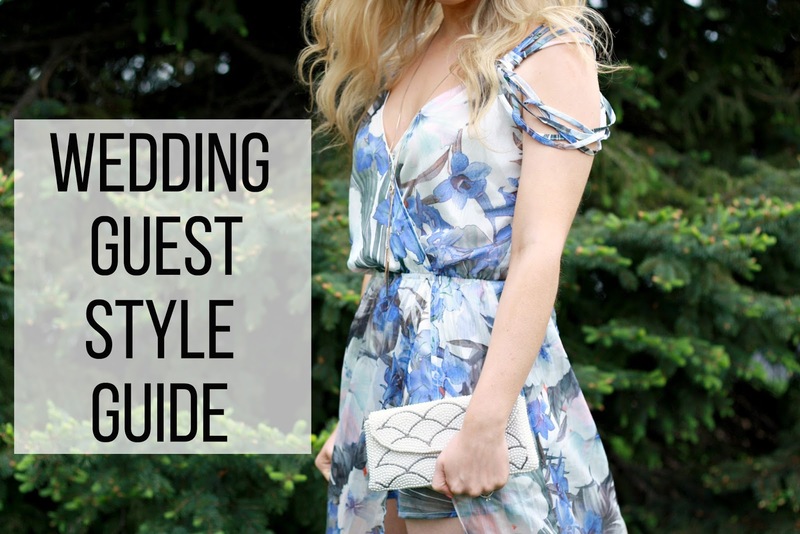 So, I wanted to share my favorite tips to help you if you're unsure of how fancy the wedding you're going to is! Believe it or not, you can easily change a look from casual to dressy and vice versa just by changing your accessories! I've made a YouTube video sharing all my best tips & tricks. It's also a sort of lookbook, showing my favorite looks for most weddings, so be sure to check that out HERE! I've also included an official Wedding Guest Style Guide by The Black Tux so you can quickly refer to it in your time of need! So if you want to get some inspiration on what to wear to the next wedding on your calendar, just keep on scrollin'! I'm sure this one seems obvious! But I've been surprised just how much going from flats to heels can change your look! In my opinion, longer necklaces give off a more casual vibe. Statement necklaces that sit higher, dress up an outfit! For more casual weddings, I like to have a small cross body bag. For weddings with a dressier style, I like to carry a clutch. The Black Tux is a super cool company. I haven't left you out fellas! If you're looking for wedding suit and tuxedo rentals, be sure to check them out for a totally unique experience! Your love Lord, reaches to the heavens; Your faithfulness, reaches to the skies.